La meilleure partie de votre séjour à Sapphire Village est on n'a pas besoin de louer une voiture si vous ne voulez pas. Il se trouve à 5 minutes à pied de la plage et Red Hook est juste un mile sur la route. Vous trouverez des restaurants, épicerie et la vie nocturne. Le ferry à St. John est également situé à Red Hook. Ne pas oublier d'aller à Loveshack Duffy si vous êtes prêt à faire la fête. Les meilleures vues de Sapphire Village-Saba Building-dessus de la marina et de St-Jean et les îles Vierges britanniques. Vacances à prix abordable pour tous. Asseyez-vous et détendez-vous sur le balcon et profiter de tous les sites. La Breeze est si rafraîchissant, assis sur le balcon ou dans le condo avec la porte grande ouverte. Lit queen dans un lit Murphy, de sorte que vous pouvez mettre le lit loin et profiter de plus d'espace dans le studio. Rénové Cuisine et salle de bains. À quelques pas de la piscine et Sapphire Bar and Grill. Off the barbecue Grille est à l'entrée de Sapphire à seulement 5 minutes à pied pour avoir un bon repas. The condo was well equipped to meet our needs. Great view of the ocean. Supplied with breakfast essentials for the week and got the complimentary rum and coke. Figuring out the TV was little bit of a struggle (4 different remotes) , written instructions would have saved me a call to the owner, who was very helpful. Very good instructions book for other things was provided. Cell service was ok and we did get the WiFi working. Sapphire Beach Condos is very hilly layout , but very walkable. Very friendly people . Your location to the pool and the Slice is the best. We loved our stay at Sailor's View. It was the perfect place for a 10 day vacation for my wife and I. The apartment met our expectations and supplied everything that we needed. There was nothing that caught us off guard which is always something that I am leery of with vacation rentals. The bed and pillows were comfortable. The building quiet. The kitchen had all the equipment that we needed. Bathroom and beach towels were provided along with beach chairs and snorkel gear. We really liked Sapphire Beach and its facilities, but it tends to get crowded on Cruise Ship days. It was our first time staying on St. Thomas and from our view, the East End is the best place to stay due to its close proximity to Red Hook and the ferry to St. John. St. John is amazing! My wife and I did the whole trip without renting a car and didn't feel inhibited by it at all. We caught safari buses and taxis throughout our stay and it was reasonable compared to renting a car. I wouldn't hesitate to return to Sailor's View again or recommend it to a friend. Words cannot describe the view! My husband and I stayed at Sailor's View for 8 days to celebrate our 30th wedding anniversary and we have never been more relaxed than we were that week. Sitting on the balcony every morning with our coffee and every night with a cocktail was a dream. The water was the prettiest blue I've ever seen! The condo was just enough for the two of us and Cindie left a bottle of Cruzan Rum that we both enjoyed. 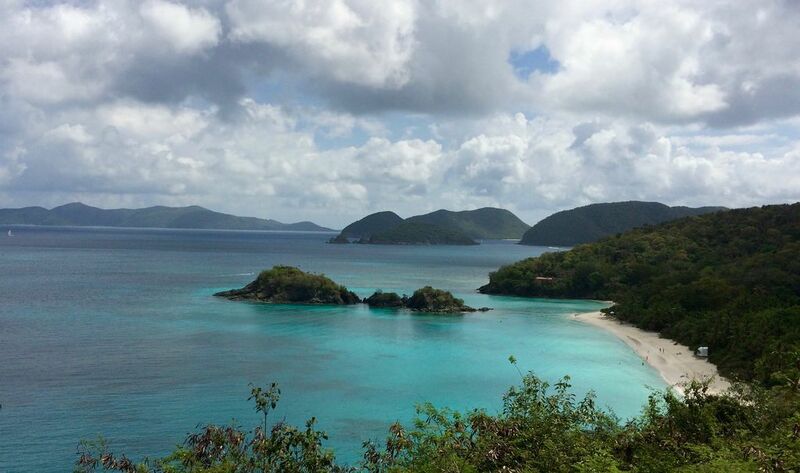 We visited Saphire Beach several times and made our way over to St. John to enjoy Trunk Bay. So peaceful! The locals are so friendly and always willing to help with suggestions of where to go for food and fun. We found Duffy's Loveshack and had a crazy time. We did not want to leave but knew we had to get back to reality. We will definitely be back again! We are so glad that you enjoyed your celebration of your 30th anniversary. Sitting out on the balcony is so relaxing and watching the boats come and go in the marina. We hope you will come back again and stat with us. We thought the rental was cute. However we were surprised to have to pay a cleaning fee for no maid service and we had to take out the trash and strip the beds prior to leaving wash dishes etc. The towels had a slight odor not as though they were fresh and only two towels which was a downer. In addition we asked a question and it took days to get a response. Finally no one ever asked how we liked the stay, the bed is small and uncomfortable. We would not rent again. I am so sorry that you did not understand this is a condo rental not a hotel. Your first response to me was that you loved it. Plus our welcome gift of a bottle of rum and cokes.. Most other condos do not provide any welcoming gift All rental units charge a cleaning fee before arrival. This is not a hotel or a resort that provides daily maid service, each unit is privately owned and people rent these condos so they can cook in and pay much less than a hotel. We ask you to take out the trash as we live in the Caribbean and if you leave food, crumbs and trash the ants and roaches will come in the condo. The trash container is about a 2 minute walk from the condo. Most guests have no problem taking out the trash or doing their own dishes. Most guests have no problem with one set of towels for a 3 night stay. In 15 years this is the first complaint about towels I have ever had. You asked a question on December 31 and it was answered the following day, with the number of a taxi service you could call. Sorry that I was out and didn't see your question fast enough for you. The towels were freshly laundered. For stays of 3 nights we provide one set of towels per person. I have been in hotels all over the world and all ask to please conserve on using towels so we have learned from experience to give guests for stays of 3 days one set of towels. For stays over 3 days we provide 2 sets of towels and 4 beach towels plus breakfast supplies, a dozen eggs, muffins, butter, milk and rum and cokes. Most guests are fine with our set up. The bed is 1 year old queen size bed it is not a small bed. If you wanted more towels you could of asked me and I would of brought you some. Most people today are into saving the environment and that means saving on water and usage of towels. Water is like gold here, it is very precious as we collect the our water into cisterns from the rain or we have to buy from water trucks, which is very expensive so we always hope that most guests understand. Because 2 Cat 5 hurricanes that literally destroyed our island there are very few hotels open. We are still to this day recovering from those devastating storms. I think in the future a hotel maybe better suited for your stay in the islands. I am very sorry that you did not enjoy your short stay with us. We do our best to make our guests comfortable. We went to STT to do some business and try to get some down time. We were pleasantly pleased with the property. The condo was very clean and well decorated. The bottle of Cruzan and coke was a welcome site to see after a long day traveling. Our view from the balcony instantly relaxed me. We didn't get a chance to eat at Slice, but we did get an opportunity to enjoy the pool (which, btw, stays open until 10PM). I would highly recommend Cindi's place! I am so glad you had a wonderful time and enjoyed the view along with a rum and coke. I hope you come back again and see us ..
We love having repeat guests. We really enjoyed the condo. The view from the balcony kept us captivated. You could watch the boats come in and out in the small harbor below. Plus Tarpon swimming around and catching a meal. The condo has everything you'll need to enjoy your vacation. Because of the length of our stay Cindie left us eggs, muffins, butter and coffee. Plus a bottle of rum and a couple of cokes. :-) Walking distance to Sapphire Beach, where you can swim or snorkel. We saw eagle rays, squid and lots of fish while snorkeling. It's only 10 minutes to Secret Harbor, which I highly recommend going to. The snorkeling was amazing there and not crowded or touristy. Plus got lunch at the Sunset Grille. Delicious. We also caught the Breakaway Charters/New Horizon boat tour. Again I highly recommend doing this too. You'll love Jost Van Dyke. St John ferries sont situés à Red Hook et les ferries BVI. Duffys Loveshack vous devez aller à boire et peut-être un sharktank. vous verrez quand vous y arrivez. Beaucoup de plaisir. XO Bistro Si vous êtes en vin, un bar à vin agréable. Il ya un restaurant mexicain à American Yacht Harbor et Molly Malones, un autre restaurant. Frenchtown, qui est près de la ville est un excellent endroit pour vérifier. Hook Line and Sinker sur l'eau, meilleurs burgers autour, selon moi. Oceana, l'un des meilleurs restaurants de l'île. Demandez une table de l'eau et des réservations sont un must.